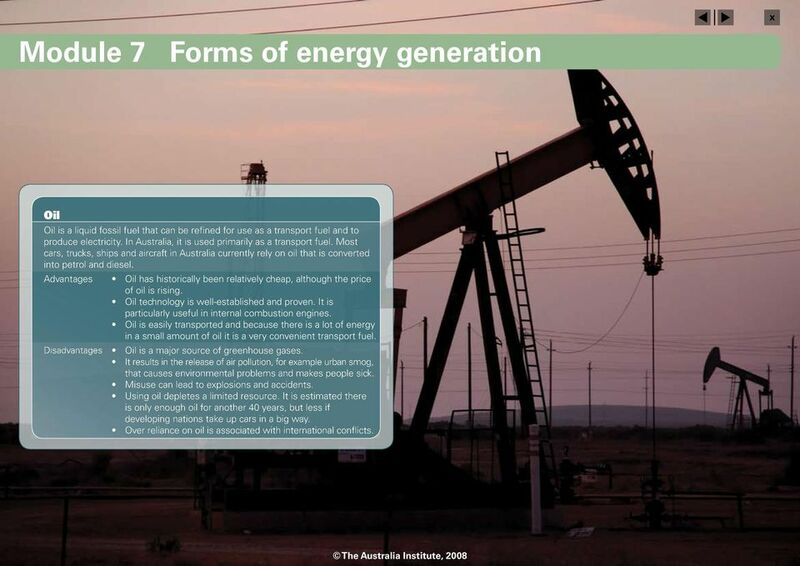 Download "Module 7 Forms of energy generation"
1 INTRODUCTION In rich countries like Australia, our standard of living is dependent on easily available energy. Every time you catch a bus, turn on a light or watch television energy is being used up. Over the past 30 years, total energy consumption in Australia has more than doubled, while energy consumption per person has increased by almost 40 per cent. See Figure 1. Between 2006 and 2020, as Australia s economy continues to grow, our energy consumption is likely to increase by 26 per cent. A joule is a measure of the amount of work, in the case of Figure 1, the work done to produce power of one watt continuously for one second. A petajoule is a million billion joules, or 1,000,000,000,000,000 joules. Petajoules (PJ) Figure 1 Australian energy consumption, petajoules (PJ), Source: Australian Bureau of Agricultural and Resource Economics, 2007 and United Nations Population Division, 2007. 2 WHERE DOES ALL THIS ENERGY COME FROM? There are two types of energy sources: non-renewable and renewable. Fossil fuels coal, oil and natural gas are non-renewable sources of energy because they took millions of years to form, under conditions that may never be repeated. Because we are running down the non-renewable stocks in the world very quickly, sooner or later they will run out. Fossil fuels are formed from deposits of plants and animals that lived more than 250 million years ago and are found beneath the earth. Fossil fuels must be produced from coal mines, oil or gas wells and are burned in order to release the energy they store. As Figure 2 shows, Australia currently relies on non-renewable energy from fossil fuel for 95 per cent of its energy needs. Of this, coal provides 41 per cent, oil 36 per cent and gas 19 per cent. When fossil fuels are burned (or combusted) the carbon (C) and hydrogen (H) in them combine with oygen (O 2 ) in the air to form carbon dioide (CO 2 ) and water (H 2 O). The carbon dioide produced is one of the biggest problems with the use of fossil fuels. Renewable energy on the other hand uses natural energy sources that are inehaustible or naturally replenished on human time scales. Renewable energy sources include solar power, wind power and hydroelectricity. All of these can be captured in different ways. For eample, an increasing number of houses in Australia now have solar thermal panels on their roofs to heat water, and many also have photovoltaic (PV) panels to convert the energy in the Sun s rays directly to electricity. Figure 2 Australian energy consumption, by fuel type, 2005 Coal % Oil % Natural Gas % Biomass % Water % Solar % Wind % Source: Australian Bureau of Agricultural and Resource Economics, Bio-fuels are also a form of renewable energy. They are made by converting the solar energy trapped in vegetation, such as sugar-cane stalks and corn, into a form of alcohol. Unlike most non-renewable energy sources, the generation of energy from renewable sources releases little or no greenhouse gases. Renewable sources provide around five per cent of energy used in Australia. Our main renewable energy sources are bio-fuels (3 per cent) and water (1 per cent). 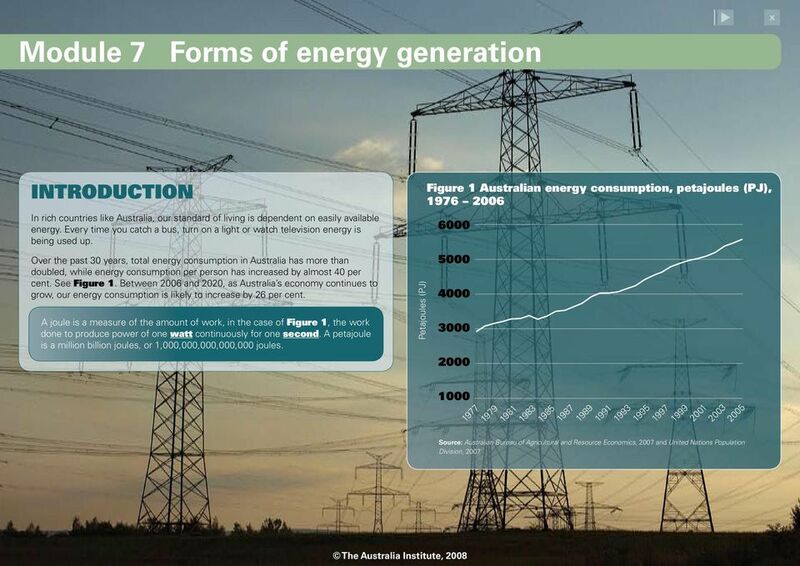 Solar and wind energy account for only a tiny fraction of Australia s energy use. There are currently no nuclear power plants in Australia. 4 Oil Oil is a liquid fossil fuel that can be refined for use as a transport fuel and to produce electricity. In Australia, it is used primarily as a transport fuel. Most cars, trucks, ships and aircraft in Australia currently rely on oil that is converted into petrol and diesel. Oil has historically been relatively cheap, although the price of oil is rising. Oil technology is well-established and proven. It is particularly useful in internal combustion engines. Oil is easily transported and because there is a lot of energy in a small amount of oil it is a very convenient transport fuel. Oil is a major source of greenhouse gases. It results in the release of air pollution, for eample urban smog, that causes environmental problems and makes people sick. Misuse can lead to eplosions and accidents. Using oil depletes a limited resource. It is estimated there is only enough oil for another 40 years, but less if developing nations take up cars in a big way. Over reliance on oil is associated with international conflicts. 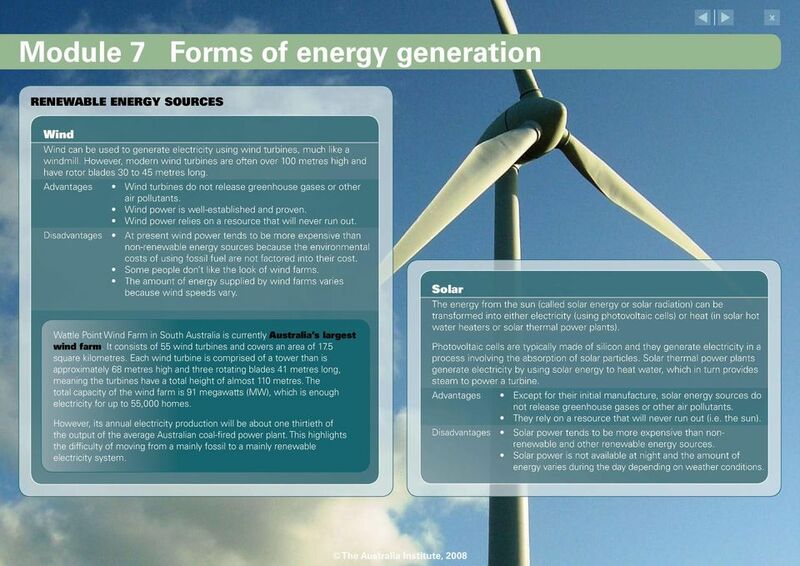 5 RENEWABLE ENERGY SOURCES Wind Wind can be used to generate electricity using wind turbines, much like a windmill. However, modern wind turbines are often over 100 metres high and have rotor blades 30 to 45 metres long. Wind turbines do not release greenhouse gases or other air pollutants. Wind power is well-established and proven. Wind power relies on a resource that will never run out. At present wind power tends to be more epensive than non-renewable energy sources because the environmental costs of using fossil fuel are not factored into their cost. Some people don t like the look of wind farms. The amount of energy supplied by wind farms varies because wind speeds vary. Wattle Point Wind Farm in South Australia is currently Australia s largest wind farm. It consists of 55 wind turbines and covers an area of 17.5 square kilometres. Each wind turbine is comprised of a tower than is approimately 68 metres high and three rotating blades 41 metres long, meaning the turbines have a total height of almost 110 metres. The total capacity of the wind farm is 91 megawatts (MW), which is enough electricity for up to 55,000 homes. However, its annual electricity production will be about one thirtieth of the output of the average Australian coal-fired power plant. This highlights the difficulty of moving from a mainly fossil to a mainly renewable electricity system. Solar The energy from the sun (called solar energy or solar radiation) can be transformed into either electricity (using photovoltaic cells) or heat (in solar hot water heaters or solar thermal power plants). Photovoltaic cells are typically made of silicon and they generate electricity in a process involving the absorption of solar particles. Solar thermal power plants generate electricity by using solar energy to heat water, which in turn provides steam to power a turbine. Ecept for their initial manufacture, solar energy sources do not release greenhouse gases or other air pollutants. They rely on a resource that will never run out (i.e. the sun). Solar power tends to be more epensive than nonrenewable and other renewable energy sources. Solar power is not available at night and the amount of energy varies during the day depending on weather conditions. 6 Water Moving water can be harnessed to provide electricity. Hydroelectricity uses moving water from dams or rivers to power turbines to generate electricity. Tidal and wave power utilise the movements in the ocean to power turbines. Geothermal Water power does not release greenhouse gases or other air pollutants. It relies on renewable energy. The construction of dams and tidal and wave generators can harm the environment. The amount of energy generated from water power can vary depending on the tides, waves and amount of water that is available. The earth s core is etremely hot as is evident during volcanic eruptions. This heat is a source of energy and can be used to produce steam to power turbines. If designed and operated appropriately, geothermal power does not release greenhouse gases or other harmful air pollutants. Unlike other renewable energy sources like solar and wind, geothermal power is available at any time. There are limited supplies of suitable geothermal resources. Geothermal energy is generally more epensive than nonrenewable and other renewable energy sources. It can harm the environment (including the release of air pollutants and destabilisation of the ground) if designed and operated inappropriately. Bio-fuels Plant and animal matter contains stored energy from the sun that can be used to provide heat and electricity. Burning wood in a home fireplace to provide heat is an obvious eample. However, modern technologies allow bio-fuels to be used on a larger scale and in more convenient forms. There are three types of bio-fuel energy sources: solid biomass, biogas and liquid biofuels. Burning bio-fuels does not increase the amount of carbon dioide in the atmosphere, provided the plant material is replaced. Bio-fuels generally release less air pollutants than fossil fuels Bio-fuels are a renewable resource. Although cleaner than fossil fuels, bio-fuels still release air pollutants. Bio-fuel generating systems tend to be more epensive than non-renewable generating systems. Some types of bio-fuels require energy to produce them. For eample, producing ethanol requires farm and other machinery. This makes some forms of bio-fuels less greenhouse friendly compared with other renewable energy sources. Growing crops for bio-fuels can result in less production of food crops. Demand for bio-fuels can also result in the clearing of forests and other natural ecosystems. 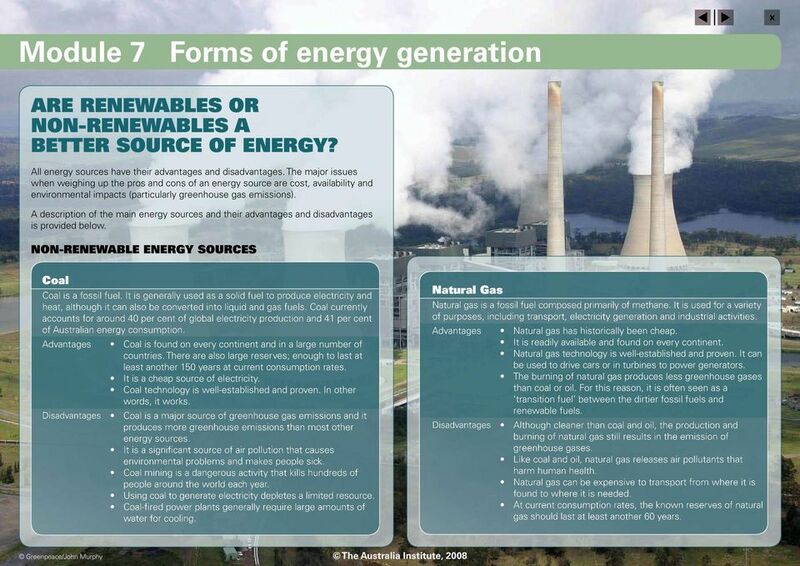 7 Module Review 7 Forms of energy generation STUDENT ACTIVITIES Comprehension Questions What are fossil fuels? List the differences between renewable and non-renewable energy sources. Eercise 1 Whatever the means of producing energy, some groups in society will benefit, while others and/or the environment will carry the cost. Select one of the above means of producing energy, and think about who gets the benefit, and who carries the cost. Can you suggest ways in which the costs and benefits might be more equitably shared? 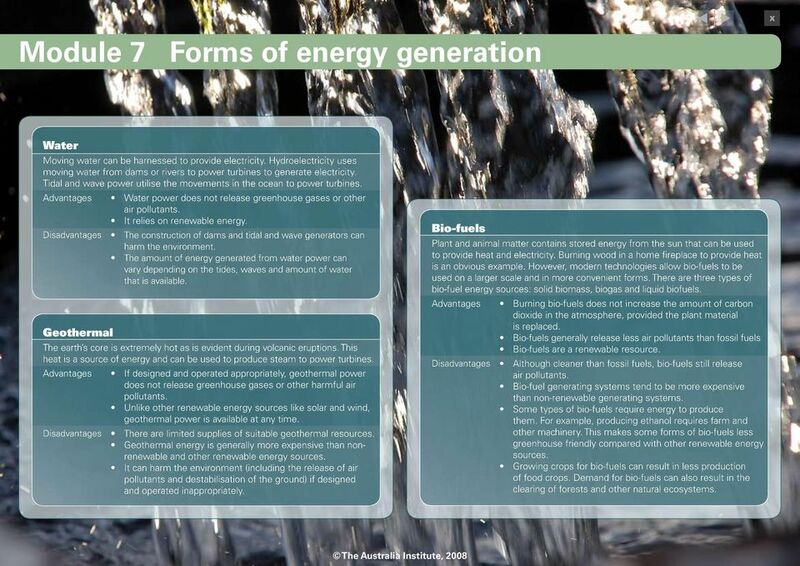 What are the three main ways of generating electricity using water? Analysis Questions Why does Australia rely so heavily on fossil fuels when it has an abundance of renewable energy sources? 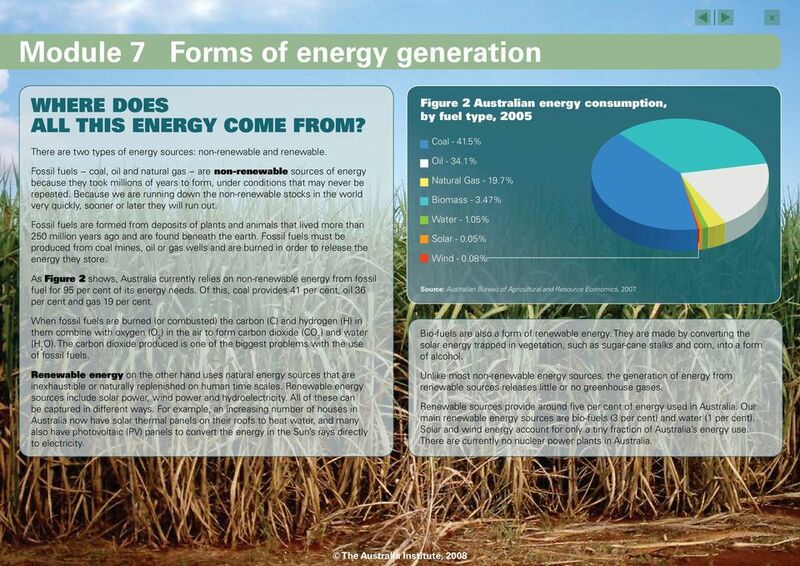 What proportion of energy consumed in Australia is from renewable energy sources? 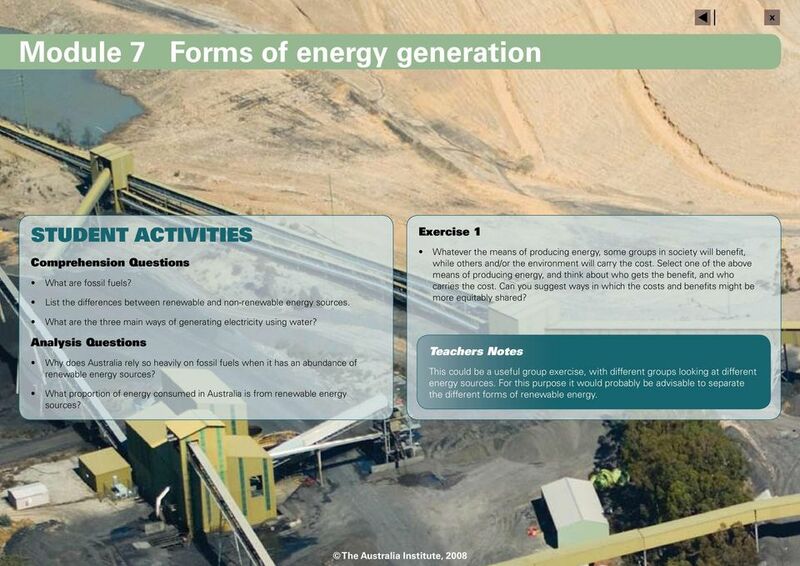 Teachers Notes This could be a useful group eercise, with different groups looking at different energy sources. For this purpose it would probably be advisable to separate the different forms of renewable energy. Homework Energy Sources May 2003 Core Paper No.3 (a) Anna drives an electric car to go to work. She recharges the battery pack of her car every 80km by connecting the battery pack to the mains supply. Renewable Hydrogen Production Using Electrolysis Hydrogen provides a promising method to help the U.S. achieve energy independence, make strides in environmental stewardship, and develop a thriving economy. 1. You can generate electricity for use in your own home using a wind turbine fixed above the roof.